I hadn’t planned on posting today since I didn’t get my entryway grasscloth wall finished yesterday. It’s not a big project at all, but I was kind of lazy yesterday and just couldn’t find the motivation to get it done. When I chose those colors for my kitchen, I didn’t think they’d be drab at all. 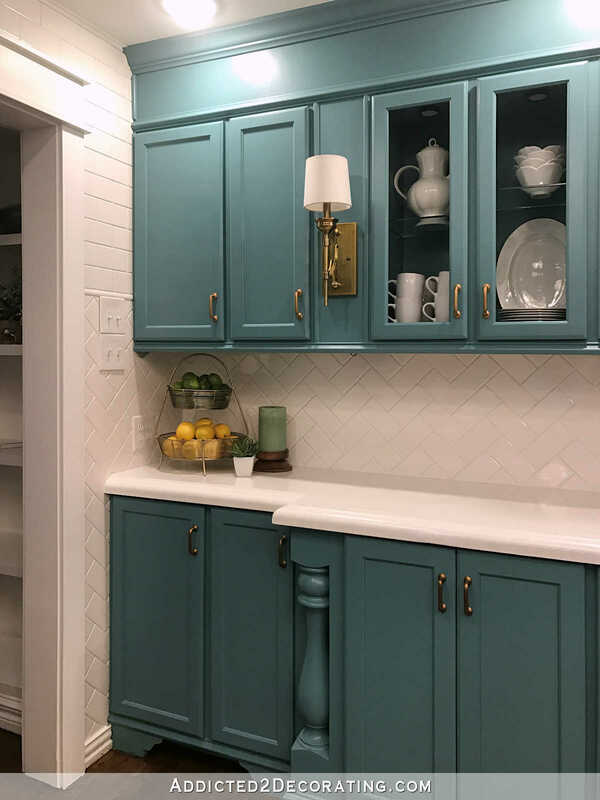 In my mind, dark blue and light gray (that looks like a really light khaki to me) was a classic combo that would look terrific in my kitchen and give me an easy color to decorate around in the adjoining rooms. I mean, as far as jumping off points go, it doesn’t get much easier than dark blue! But it just didn’t work out in reality like it did in my mind. 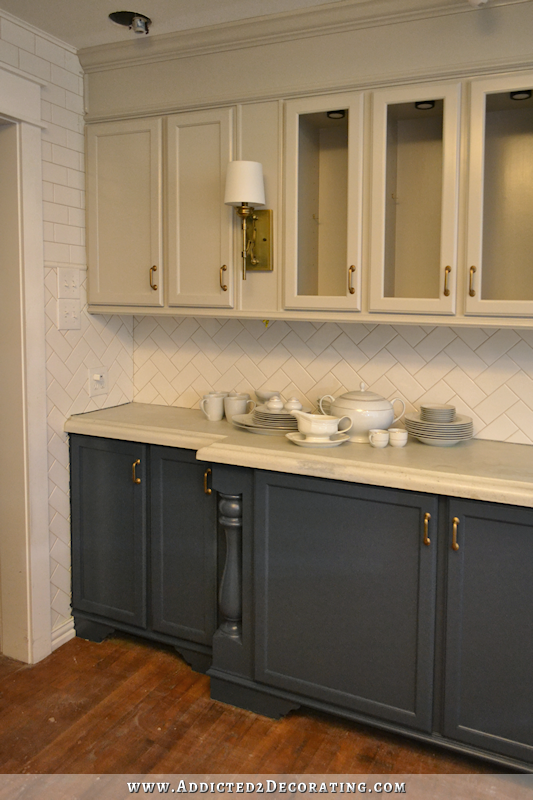 Even if I had held off until I got my countertops refinished a brighter white, and got my bone-colored grout all Grout Renewed so that it was bright white, I still don’t think the blue and gray would have done it for me. And of course, there’s absolutely nothing wrong with navy blue and gray. Again, it’s classic. It’s beautiful. But it’s just not me. And I had to actually see it in person in order to realize it. It was a pain to change it, especially since I had already repainted an entire wall of cabinets and had spent $120 on paint. I certainly could have forced myself to just live with it, and convinced myself that wasting that time and wasting that $120 would be irresponsible. But boy, and I glad I gave myself permission to change my mind! Because now, I have a kitchen that puts a smile on my face every single time I enter the room. I have a kitchen that suits me, and finally feels like more than just a decorated room, but actually feels like my home. Obviously, teal isn’t for everyone. And lots of people would compare those two kitchens and find the blue and gray combo more appealing. But the point is that decorating and designing our homes is a journey, and it’s a very personal journey for each of us. There’s no “one size fits all” option out there. And with so many options, we’re not always going to get it right the first time. And when you don’t get it right the first time (or the second, or the third), it’s okay to change your mind and keep on trying until you get it right. Yes, you’ll probably catch some flak for it, just as I have over the last couple of years. But don’t let that stop you! Don’t let others’ opinions stop you from trying out different things until you get exactly what you want. Be bold. Be brave. Take a chance. Yes, thank you!! I have been feeling soooo guilty for the curtains I bought in October but just couldn’t love them, even though they are beautiful! I finally bought some I feel are more me. Love your blog! Funny thing this life we have…. It truly is the journey that must be enjoyed. And all the trials and errors that brings. For in the end, no one gets out alive anyway. Change is a great thing, it leads us to a better understanding of ourselves and each other! My hat is tipped to you again for a great post! I do love that about you, if it doesn’t seem right or you don’t like it, you go ahead and change it. Sometimes the thought of something and the actual look of something can be very different. That said, I am soooo glad that you changed the kitchen color. I never felt that the blue and gray went well in there. Everything you have now done is absolutely beautiful. Thank you, Kristi! Well stated message and happily received! My colorphobic self is actually considering your teal mix for my lower cabs! If you don’t experiment, you will never discover what you like and don’t like. I for one, love the teal. My home has changed over the years as I get tired of previous decor and redo it. The local BM paint store knows me well. I’ve benefited by more than one of your “learning experiences” Kristi. After seeing your blue and gray cabinets I copied the look for my living room accent wall and fireplace. Gentlemen’s Gray and Revere Pewter might not be “you”, but they’re definitely “me”! Definitely about staying true to yourself too. I love teal, but even if I didn’t the gray and blue was wrong for the light in your kitchen. It just looked dingy. But they are lovely colors together. It’s as much about the light in your home as anything. Sometimes a really great color looks awful because of what bends the light on the way in the window, or the lack of windows. Whew, for a second there I thought you’d gone back and repainted your upper cabinets. The old colors looked nice but like you, the teal puts a smile on my face. I totally agree that the only limitations to changing your mind should be financial or similar. You shouldn’t live with things you don’t like in your home because it’s your one and only real sanctuary. I’m glad you found your color! It feeds the soul! I love that… “It’s just paint, man!”. That’s a good pithy motto to decorate (live) by. Picked my porcelain tile then, 8×48 inch tile sample in hand, went to select grey cabinets. NOTHING “went” with the tile, nothing. Tried all the “ivories”…another NO. Pulled an UGLY color door (look up SW “Urban Bronze”) and it was freaking perfect. (Really, it’s an ugly color…kinda brown / grey / olive.) Countertops are Bianco Antico. My kitchen is beautiful BUT, not at all the vision I started out with. Conclusion; select the ONE material you MUST HAVE (tile, granite, cabinets) and build from there. If you (or Dear Hubby) have Kristi’s amazing abilities you can disregard my advice. I just looked up urban bronze. I bet your kitchen is gorgeous! The color is very nice! CHIFLIPPER, I think this is awesome advice and rings true to my experience!! (Do you flip houses in Chicago, by any chance, guessing from your user name?) So what did you do? Did you paint your cabinets Urban Bronze? Phyllis…I flipped two in Chicago before moving to Phoenix. Arizona is far more “laid back” when it comes to inspections etc. Not to worry, I never put “lipstick on a pig”, the flips were done top-to-bottom; windows, plumbing, wiring. My cabinets are maple Thomasville in “Forest Floor” (Home Depot) which is really close to SW Urbane Bronze. I wanted the factory finish. I have NO uppers, the bases are all drawers. Wow, thank you for this post, uncanny timing- I really needed it today! I’m going batty wanting to get my living room more finished and layering in more personality. I just need to jump into it instead of trying to get everything “right” on the first try. Thanks for this reminder. And love your teal and that you found your color happy place! Kristi, I have loved every iteration of your kitchen, and actually liked the gray uppers and dark blue lowers, as I thought with the lighting in place and the counters finished, it’d be classic and gorgeous. You really do have impeccable taste. But you’re right, the teal kitchen is beautiful and happy, and so “you,” so it’s perfect! It puts a smile on my face, too, every time I see it. Changing one’s mind is not the end of the world and should be embraced, because we truly don’t know how a design idea is going to look or feel until it’s actually in place. That said, I agree with what someone upthread said, hiring that out gets really expensive, and some (like me) just don’t have the physical stamina or finances to be able to change major stuff like a kitchen, so must deal with the anxiety of trying to get it perfect from the start. That’s the kind of thing that makes it really difficult to even begin! I like your post! Very true! A home is a continuerous project! so what if a room gets done, redone and done again! Tastes are always changing. That is what makes it fun! Thank you. I really do like most everything you do and the fact that you do it to make yourself and Matt happy is what is most important. I recently went to my first ‘painting party’ with a group of co-workers. I was afraid to go because painting is NOT my strong suit. My co-workers assured me that it was okay and I would be fine because the lady who makes the signs stencils everything for you so you just paint. I went and we had a lot of fun and my sign turned out pretty well. After a few days of looking at it I felt like the word ‘sunshine’ didn’t show up on the background enough. I purchased a paint pen in a sunny yellow and outlined the word sunshine and I LOVE IT! Thank you for showing me that it’s okay to change or improve something because I like it. Thank you! One of the things I appreciate about your blog is that you are not afraid to re-do something that you are not satisfied with. Although, I did find that kitchen re-do painful, it does look great and I’m glad you’re happier with it now.